The Business Restaurant is designed to create comfortable and elegant environment for social contracts. The restaurant, seating 100 guests, offers wonderful opportunities to dine with partners and discuss business or to enjoy the company of family and friends. The painted ceiling and refined decoration are eye-catching and create a pleasant ambiance. 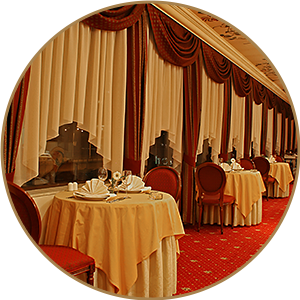 The Business Restaurant serves first-class meals, mostly of the European and Mediterranean cuisine.